Seotda or Sutda, is a Korean game, that is featured in the popular Tazza Movies. ​For a Rule Card/ Hands reference scroll to the bottom! So the two games I've shared with you so far have been traditional matching games. So I wanted to share with you a Poker like game that came from Korea. This game was featured in the Tazza movies, and is very popular (there are a ton of App games for it). But despite their popularity, there is little to no reference in english for this game online. I found one site Harry's Hwatu, who admirably attempted to translate it, but it still didn't seem right. So I combined his attempt, a google translation of the rules for a few apps, and my own playing of multiple Korean apps (with no english options!) to present you with what is hopefully... Seotda. With that in mind, some names of hands might be wrong/ mis translated/ not used properly. Also I might have missed some rule nuances. But what I have is an enjoyable Korean variant of essentially, Stud (Seotda... Sutda... Stud? Maybe a connection?). Seotda ( 섯다) Literally means " It Is" and is essentially 2 card stud, or as my Partner's family likes to call it " You get what you get". This is a betting game, and while it uses the Hanafuda/ Hwatu deck, it's assembled differently, only using 20 cards. I'll go into this later. I find it extremely interesting that many Hwatu decks I own have numbers on them (1's on January cards, 2's on February etc.) So far only Seotda has used these numerical values for their scoring, which has lead me to believe that it must have been popular enough of a game to effect future printing of Hwatu. But for being so popular, it is extremely hard to find any english information on this game. So if I have any Korean readers who would like to weigh in on this, it'd be greatly appreciated. It seems like a well kept, enjoyable secret. Or maybe it's because it's so similar to 2 card stud? Before play, it's important to agree on a starting bet rate, like with poker. Number of Decks: One edited deck. Discarding November and December, and only using the Animal cards, and ribbon cards of January through October. However January and March have no animals, so the deck used their brights, and August has no Ribbon, so the deck also uses it's Bright. 1. Deal: The dealer deals 2 cards to each player. Chekeu (Check 체크) : Defer your bet till after all bets, then place bet. 3. Reveal:Players reveal their hands, and the highest hand wins the pot. 2.Reveal One: Players choose one card to reveal. 4. Second round of betting: Players bet again using the same betting rules. 5. 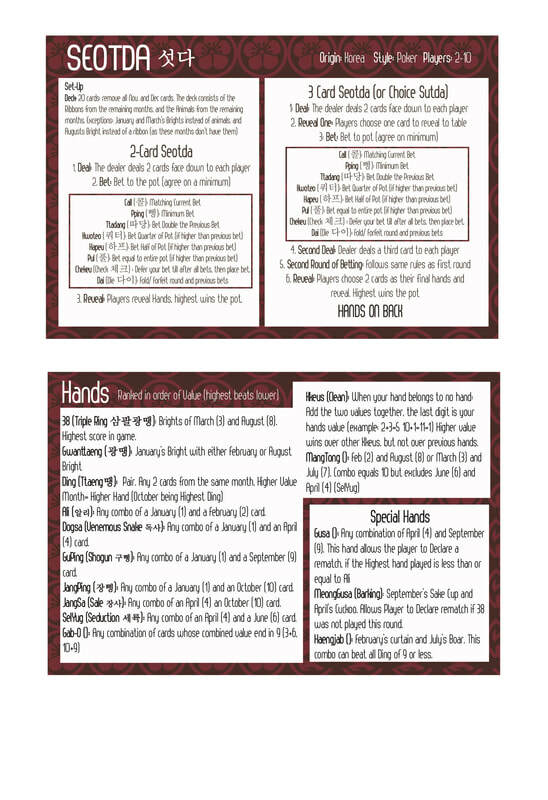 Reveal: Players choose 2 cards to form their hands, and the winner with the highest hand wins the pot. 38 (Triple Ring 삼팔광땡): Brights of March (3) and August (8). Highest score in game. Ali (알리): Any combo of a January (1) and a February (2) card. Dogsa (Venemous Snake 독사): Any combo of a January (1) and an April (4) card. GuPing (Shogun 구삥): Any combo of a January (1) and a September (9) card. 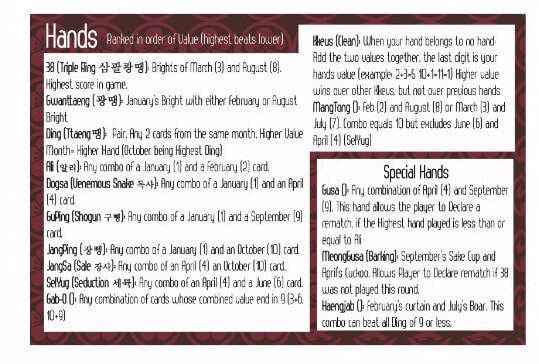 JangPing (장삥): Any combo of a January (1) and an October (10) card. JangSa (Sale 장사): Any combo of an April (4) an October (10) card. SelYug (Seduction 세륙): Any combo of an April (4) and a June (6) card. Kkeus (Clean 끗): When your hand belongs to no hand: Add the two values together, the last digit is your hands value (example: 2+3=5 10+1=11=1) Higher value wins over other Kkeus, but not over previous hands. MeongGusa (Barking멍텅구리 구사): September’s Sake Cup and April’s Cuckoo. Allows Player to Declare rematch if 38 was not played this round. Haengjab (땡잡이): February’s curtain and July’s Boar. This combo can beat all Ding of 9 or less.